Quite simply, head coach Bobby Clark described the upcoming weekend as one of the most exciting in his recent memory. “The two games we open up with … you couldn’t get two bigger games for the first weekend,” Clark said Thursday afternoon as his No. 4 Irish squad prepared to travel to Bloomington, Indiana. Notre Dame opens its regular season with a pair of fixtures as they participate in the adidas/IU Credit Union Classic — the first takes place Friday night against defending Big Ten champion No. 13 Maryland while the second pits the Irish against tournament host No. 14 Indiana. Irish senior midfielder Patrick Hodan looks up the field during Notre Dame’s 1-0 loss to Virginia on Nov. 30 at Alumni Stadium. The Irish are coming off a strong showing with a 1-0 victory in their final warmup game against No. 22 Saint Louis, but Clark said the regular season is a different beast altogether. Clark mirrored the excitement of his players as he elaborated, claiming the start of a new academic semester carried a lot of energy on its own. Of course, renewed social lives will have to remain on the back burner at least for this weekend while the team faces two nationally-ranked teams away from the friendly confines of Alumni Stadium. Though Maryland is fielding 13 newcomers this coming season, Clark denied any real notion of an extended rebuild for the Big Ten soccer club. One particular area to watch in the coming season, both this weekend and beyond, lies in the production of the Irish offense. 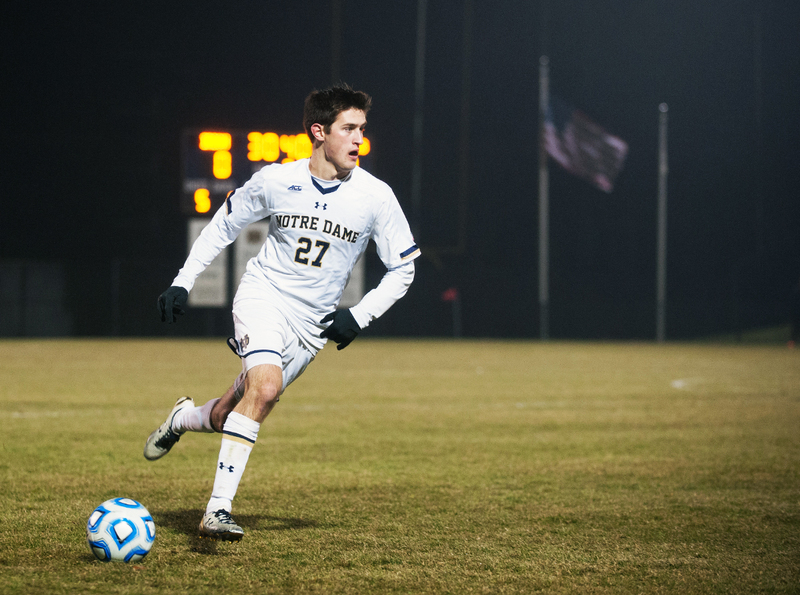 In recent seasons, the team has established a reputation of scoring by committee — senior midfielder and captain Patrick Hodan led the team with nine goals last year, while five other players managed three or more goals in 2014. Clark insisted individual performance and records mattered little to his squad when compared to the team’s long-term success. Notre Dame and Maryland are scheduled to begin at 5 p.m. Friday at Bill Armstrong Stadium to kick off the adidas/IU Credit Union Classic. The Irish and host Hoosiers will then square off at 2 p.m. Sunday to conclude the weekend’s festivities in Bloomington.